There’s no better business plan than producing cars that lots of people want to own. 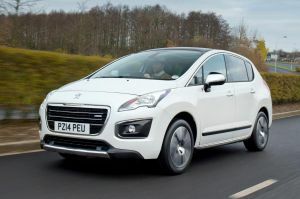 That’s exactly what Peugeot has achieved with its 3008 Crossover model that over 580,000 buyers world-wide has snapped up since it broke cover in 2009 – of this total 56,323 have gone to UK buyers. That success has been recognised by an abundance of UK awards such as the What Car? Of the Year 2010, Best Crossover 2010/2011, Family car of the Year and so on. Obviously the underpinnings come from the highly successful Peugeot 308 hatch back range which donates the good handling and riding characteristics but from there on extensive body development creates a vehicle that is of generous but not clumsy dimensions and packed with numerous clever ideas that focus on practicality, comfort and high standards of occupant safety – a 5-star Euro NCAP rating is the norm with all current Peugeot models. Yes, there is some visual suggestion of both a Sports Utility Vehicle (SUV) and a Multi Purpose Vehicle (MPV) but the overriding characteristic is of a practical hatch back that has the spacious and comfortable accommodation, both for five occupants and luggage, of an executive class vehicle. Recently, Peugeot carried out a mid-term facelift that concentrated on the car’s nose and bonnet line that I feel has given a touch more prominence, certainly a bit more style for a class of vehicle where adventurous body styling is more of a challenge. Thus I suggest, when checking out this model that some concentration is given to the tail-gate which is not the usual piece of pressed metal and window. This one cleverly split folds at a very low level to create a handy platform while the easily operated 60/40 split fold rear seats ensure a totally flat load area that can swallow large loads or provide a mix of four or three seat occupancy plus retaining a useful through load platform. There are three speciation levels, Access, Active and Allure in that order of price, the latter tested here is the Allure version powered by the most popular 1.6 turbo diesel 115 bhp engine that accounts for around 50% of UK sales. It is a €5 emissions rated engine delivering a highly flexible 115 bhp in an amazingly quiet manner and good for, according to Peugeot of a top speed of 112 mph and able to reach 62 mph/100 kph from rest in a creditable 13.6 seconds. This performance is creditable for the power to weight ratio though the real bonus is the smooth and lively take-up at intermediate speeds that is partially down to the slick shifting close ratio 6-speed manual gearbox that also ensures impressive cruising ability at motorway paces. Consumption should be around the 45/50 mpg region under real life driving and with exhaust emissions of 127 g/km the road tax is £120 after a free first year. Alternatives include a range of 1.6 turbo petrol engines (120 to 163 bhp), 2.0 turbo diesels, a Diesel Hybrid version plus a Euro 6 complaint 1.6 diesel emitting a mere 108 g/km and automatic transmission options for both types of fuel. My initial impression, when getting into what is one of the most comfortable car seats on this planet, is that the standard of finish, interior styling and overall quality matches a lot the so-termed premium class products. The fascia is none too busy but it provides easy information including a face-up indication on the windscreen that now includes full-colour illustration between the different functions i.e. mph and satellite navigation, and an updated reversing camera that, importantly, shows more of the area immediately behind the vehicle. I have long considered Peugeot cars to be sufficiently comfortable for me to go the proverbial extra mile (or more) and this one provides excellent comfort for all shapes/sizes of driver, good vision day or night, rain or shine and light yet very responsive controls allied to easy handling and good road grip. I suggest a rewarding yet relaxing drive though I would point out that front seat access is a little higher than the conventional car. Items of note includes auto-fold exterior mirrors (when remotely locked), soft touch fascia, hill start assist with electronic automatic park brake and an optional Grip Control System. Peugeot state that the 30-08 is in mid-term that, to me suggests two factors – that it is an immensely successful, fit for purpose, vehicle and that it will continue further development though without drastic change to ensure good residual values that will undoubtedly retain a strong customer base. It makes a lot of sense. MAIN RIVALS: Renault Grand Scenic, VW Tiguan, Vauxhall Zafira, Ford S-Max, Citroen Grand Picasso, Mazda CX5.